Mandala, is basically a Sanskrit word. It means circle and represents wholeness, unity, and harmony. Even though it is dominated by triangles and squares, a mandala includes concentric structures. Various kinds of mandalas are applied for different purposes in Buddhism practices including the sutra & tantra. You can get dharma chakra mandala online, which will help you generate spiritual mental thoughts. Outer mandala comprises of flat-bottomed bowl held side up with three mounds of gems or raw grains placed on top of one another. It is enclosed within progressively small concentric rings and crowned with an ornate crown. On the other hand, this offering can be made with hand-mudra. It includes fingers inter-twined in specific pattern. 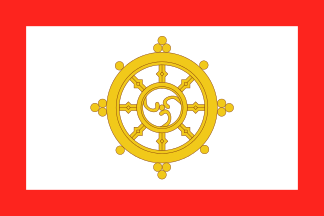 According to abhidharma teachings the system has 4 island-continents that surrounds Mount Meru, In Kalachakra system, world system shape differs a little. It has Mount Meru but includes four island-continents and eight small islands. Dalai Lama, his holiness often told devotees to imagine outer mandala as the solar system, earth, galaxy, universe, or planet just like the modern science visualizes them today. Anuttarayoga tantra is the highest yoga tantra. It includes four offering levels correlating with 4 empowerments. Outer offering is related to external objects like water incense, flowers and more or desirable elements of your five senses. A kalash abhishek purifies your body for obtaining a Nirmanakaya (Body of emanations). It allows the devotees to visualize themselves as Buddha-figures. The aspects of internal offerings may include your whole body, where trunk represents Mount Meru and 4 limbs as four island-continents. This is a secret empowerment, which purifies the delicate energy-winds as well as speech for obtaining a Sambhogakaya (Body for full use). It allows complete stage practice of illusory body. Hidden offering creates blissful awareness. Offering of hidden mandala correlates with deep discriminating awareness. It purifies mind for obtaining dharmakaya (Body that encompasses deep awareness). It allows you to practice clear light or direct vision. A mandala offering of two inseparable truths includes pure appearance as Buddha figures and blissful cognition of awareness. It purifies the mind, body, and speech together for obtaining Svabhavakaya (Body that includes natural individuality). It allows you to practice amalgamated pair of two truths. Mandala offering means the eagerness to give away everything in this universe to obtain teaching, vows, or empowerment.